I arrived at Le Delice early and as I breakfasted people began to arrive. By the time we were ready to leave there were 14 of us. Not bad for a January morning with rain forecast later on. It was good to see riders I had first met a while ago on rides last year, returning and keen as ever! We headed off down the good old Waterlink Way! We turned off it to head through the Bellingham estate and pick up a route through Beckenham Place Park. At the moment it’s not possible to do a circular route round the park, unless you are prepared to do a bit of off roading through the woods. 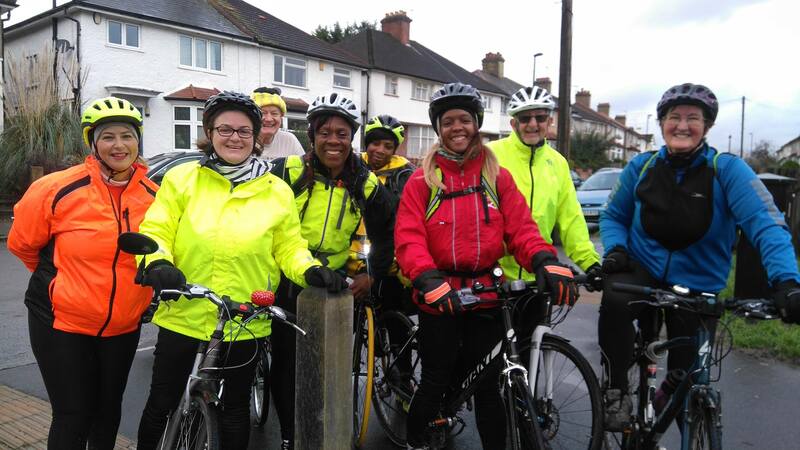 And with all the recent rain, while a couple of us were riding bikes which could have managed, most were on road bikes which would have struggled. So we exited near Crab Hill and everyone got their first workout of the ride climbing that. It’s steep but short, and we don’t mind if some of us have to get off and walk on these shorter local rides. They are meant to be for everyone and are our easy rides! It’s just that, Lewisham being a hilly borough, it’s hard to plan a variety of rides without any hills at all. Once up,and down the hill, we went back into the park and rode along past the golf course. This park is to be redeveloped soon and one of the things we will request is a good circular route, suitable for all ages and abilities to ride. We left Beckenham Park just opposite Braeside, crossing the busy main road on foot. Then a great descent took us down to Copers Cope Rd and we we picked up the Waterlink Way again, all the way to South Norwood Country Park. We rode past the pond and out through the other side, heading back northwards now. Then the rain started, but it was not cold and nobody seemed to mind even when it got heavy for a few minutes. One of the difficulties planning good riding routes in this part of London is the large number of railway crossings. We had already crossed the railway a couple of times and now we’re heading towards another. The footpath that took us there was almost completely blocked by a council vehicle and a worker, cutting back the brambles. A good job that needs doing, but the path was littered with fresh cut brambles and thorns. To be safe, we dismounted and carried our bikes through. This ride is two circular routes joined in the middle at the Kent House railway crossing which uses the station underpass. We used it in both directions today, and now used it to get to the quiet road that leads up to Sydenham High St. Once there, we decided to have coffee in Semas, right by Silverdale Rd. I was concerned that the Mayow Park cafe would struggle to cope with us all, as its very small. Semas is a good, old style London caff, no cappuccinos or lattes on offer but good sarnies on crusty bread and hot coffee and tea, served promptly and cheaply by helpful staff. Good little caff. After our break, we ride down to Mayow Park and viewed the cafe as we did a quick circuit. Then out and down to another railway crossing, not as easy as the others we had used. A very steep set of stairs with a badly positioned wheel channel, a bit too near the sides for wide handlebars. Everyone managed today but in the past we have had to carry bikes for less able riders, young children and people with non standard bikes. Not good enough when it’s on a cycle route and there is plenty of room to include less steep alternative such as a stepped ramp. From the other side it’s not far to Wells Park. Some of us again walked up the steeper bits in the park itself and the last bit of the road as we left the park. Up here is one of Lewisham’s high points and now it was all downhill from here. The steepest descent of the ride is Sydenham Hill and if you remember to look up as you begin the descent, you get an amazing view of London’s skyline. We crossed the south circular by Hornimans using the crossings, fiddly and inconvenient though they are, it’s the only way to get on to Wood Vale and after that another descent with another fine London skyline view as you drop down to the quiet roads between East Dulwich and Peckham Rye. And Peckham Rye was our last park visit of the day as we ducked into its southern corner and rode all the way up the path which along its southern end. This delivers you to a gate that leads on to the cycle route to Crofton Park and Catford which links neatly to the Waterlink Way in Ladywell Fields after crossing Brockley Rise. As I turned towards the entrance to the Fields, I paused and waited for the rest of the group. A few had already turned off, to head at convenient junctions nearer there homes. At this point, I knew our southern Lewisham and Bromley riders would not want to head all the way through the Fields back to Ladywell, so here would be a good point to say our goodbyes, some heading south, others north. And indeed, the group decided to split here. We took a farewell photo, chatted about future rides and then parted. A lovely bunch of people who were a pleasure to ride with. I hope to see them all again soon.